Building diverse and inclusive teams is the No. 1 talent priority for HR and talent acquisition professionals, according to the Global Recruiting Trends 2018 report. Research shows that diversity is tied directly to company culture and financial performance. In fact, LinkedIn data shows that 78% of companies prioritize diversity to improve culture and 62% do so to boost financial performance. As organizations seek to create more diverse and inclusive workplaces, the reality is these initiatives are hard work. Talent leaders and recruiters have shared that they need better insights to inform their companies diversity goals and identify diverse pools of talent – and they’re looking for scalable learning tools to empower their teams to be more inclusive. That’s why today we are rolling out new insights to help you to plan for, hire, and develop inclusive teams. Our guiding product philosophy is “diversity by design,” which means that LinkedIn’s diversity insights will be a core part of every stage of your talent process, whether you’re planning and setting recruiting goals, crafting your team’s sourcing strategy, or investing in your teams. While there are many facets of diversity, our first product steps will begin with aggregated gender insights. Gender representation is a strategic priority for companies around the globe, which is a big driver on why we’re starting there. In the future, we plan to expand to other areas of identity based on how our LinkedIn members self-identify. Because we value our members’ privacy, we will not individually identify profiles by gender, but instead provide aggregated insights to help you develop more inclusive sourcing strategies. To help you plan and execute diversity recruiting goals at your company, we’re introducing a Gender tab in the Company Report in LinkedIn Talent Insights. 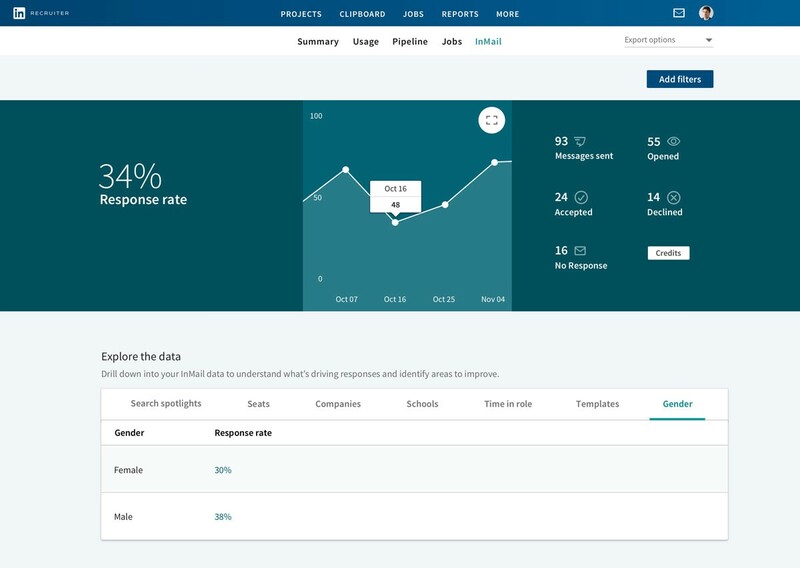 Talent Insights is the talent analytics product we recently launched to give you real-time, actionable data and insights to answer some of your most strategic talent questions. 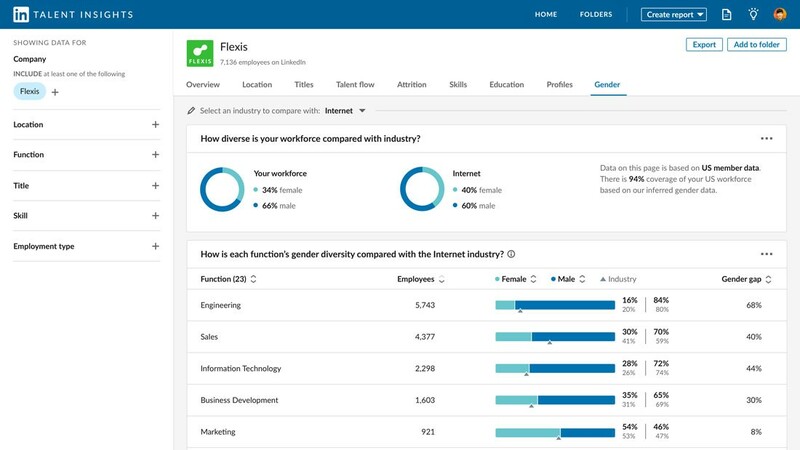 By clicking on the new Gender tab (a private tab just for your company), you’ll be able to see the gender representation of your company’s overall workforce as well as within different functions. You’ll also be able to benchmark against industry averages. This real-time visibility avoids manual processes that deliver data that is often outdated by the time you get it in your hands. For example, say you work for an Internet company called Flexis and one of your strategic initiatives is increasing gender representation across technical roles. How do you set realistic recruiting goals to promote greater representation? First, you need to understand where Flexis is starting from. In the report example below, you can see that Flexis’s gender representation (34% women and 66% men) is below the Internet industry average (40% women, 60% men). The report also shows that Engineering and Information Technology are the functions with the biggest gender gaps at Flexis, giving you actionable data points to bring back to your business leaders and help inform inclusive recruiting goals in the year ahead. Now that you’ve set your hiring strategy and aspirational goals for Engineering and Information Technology, the next question is how do you craft a recruiting strategy to meet those goals? 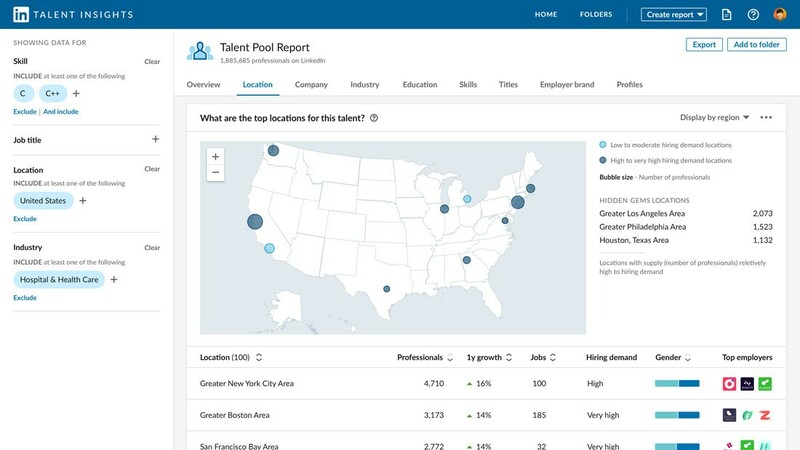 To help you build a data-driven plan, we’ve also integrated gender insights across Talent Pool reports in Talent Insights to give you real-time gender representation information for different talent pockets across the United States. This allows you to identify opportunities by city, industry, job title, and skills. For example, let’s say you’re sourcing for Flexis’s Engineering team and they’ve asked you for a diverse slate of candidates skilled in C and C++ programming. 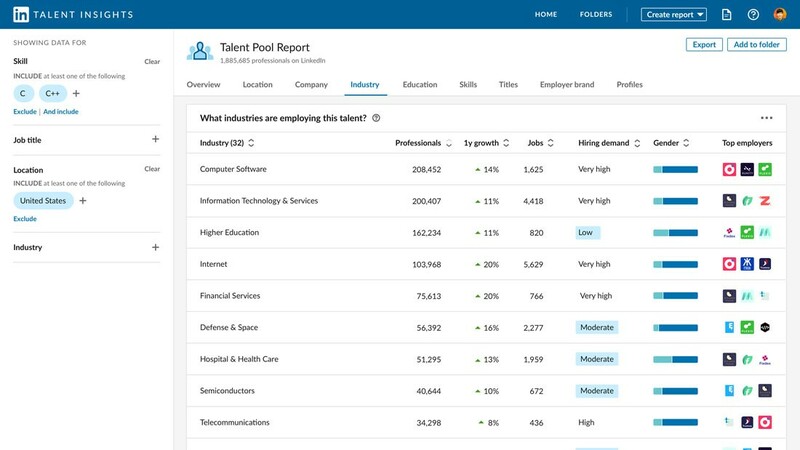 In the Talent Insights Industry tab, you can now see which industries have greater gender representation with C and C++ skills. You also discover that in health care, there’s a greater representation of women with the skills you’re looking for (40% women), which means this is a good place to start your search if Flexis’s goal is to increase its share of women in technical roles. Talent Insights also helps you discover that New York, Boston and San Francisco are cities with greater gender representation with those technical skills, and good contenders for programming initiatives. Using these new insights, you can now do two things. First, you can source from talent pools that are most likely to help you build diverse teams. And at the same time, you can make a data-driven case to your business partners for considering different talent pools (new cities or new industries) than they’ve historically focused on in the past. Beyond Talent Insights, we’ve also invested in making sure that searches in LinkedIn Recruiter deliver a diverse mix of qualified candidates to your team. 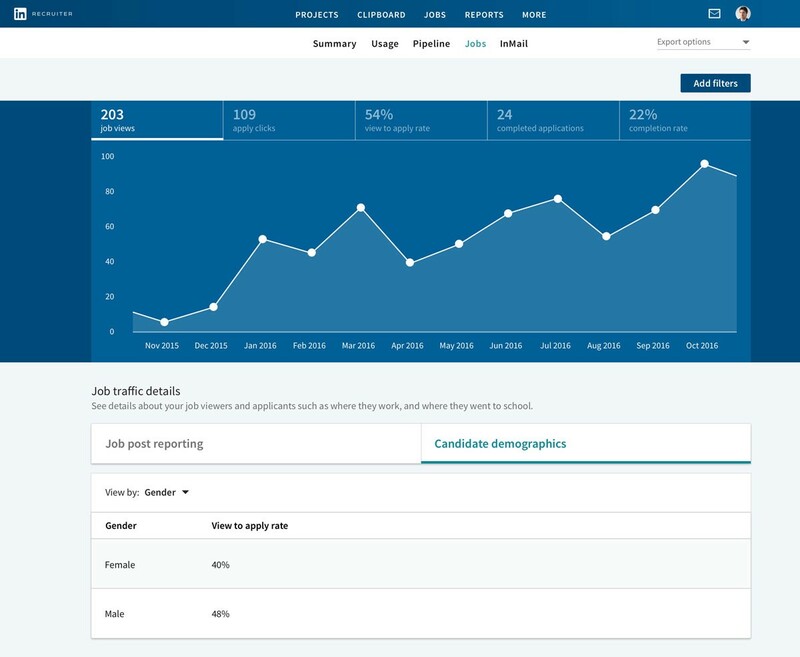 This won’t change the set of qualified candidates in Recruiter search results, but it does mean that each page of results will reflect the gender mix of the available talent pool starting from page 1 of Recruiter search. As a very simple example, if the available talent pool for programmers with C and C++ skills in the Philadelphia area that you identified in Talent Insights is 42% women and 58% men, you’ll see that same basic proportion on each page of results to make sure your recruiting team is seeing candidates that best reflect the gender distribution of the marketplace. Over the next few months, LinkedIn Recruiter will also include reporting that shows you how your Job applications and InMail messages perform across genders to make sure you flag areas for more inclusive tone, language, and outreach. 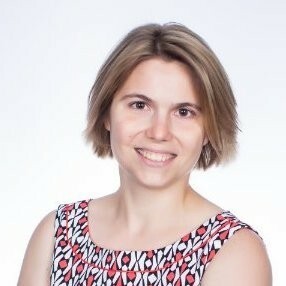 If, for example, you find that men are disproportionately more likely to respond to your job posts or to your InMails, you may want to consider rewriting them so they contain more inclusive language and avoid the many words, such as ambitious, hacker, and determined, that are more likely to drive away female candidates. Finally, we recognize that data and insights are useful tools, but the real impact comes from teams who are committed to inclusive hiring practices. If your team needs additional help getting up-to-speed on unconscious bias and diversity recruiting, LinkedIn Learning is a a scalable platform that offers on-demand education for your managers and teams. Confronting Bias is led by Verna Myers, vice-president of inclusion strategy at Netflix, and Arianna Huffington, founder and CEO of Thrive Global. Both Myers and Huffington discuss the impact of our cultural lenses on daily relations and share tips on how to counter bias in words and action. Managing Diversity is taught by Catherine Mattice Zundel, an international HR consultant and president of Civility Partners, and helps you create a strategic plan that supports diversity and inclusion in your workplace with key metrics and benchmarks for success. Inclusive Leadership is led by Dr. Shirley Davis, an international speaker and talent management expert who outlines a best-practice framework for developing inclusive leaders and tips on how to avoid common leadership pitfalls. Diversity, of course, means far more than gender equality (though that would be a pretty awesome start). Our long-term vision at LinkedIn is to power clear and actionable diversity insights across many other demographics — veteran status, race, ethnicity, disability status — as well as diversity of skills, experience, and backgrounds. This is just the beginning for us and we’re looking forward to helping your team plan, hire, and develop with inclusion in mind and by design.